Doran-Alabama Propeller Com- pany of Mobile, Ala. has pub- lished an eight-page full-color brochure describing its complete propeller manufacturing and re- pair capabilities. Doran-Alabama Propeller, in business since 1950, offers all boat and shipowners a full line of knowledge from repairs to en- gineering, with 32,000 square feet of production area fully equipped to serve the industry. The brochure also describes the firm's four main propeller types for towboats, workboats and deep-water fishing boats. It in- cludes photos of the propellers and specification charts for each. 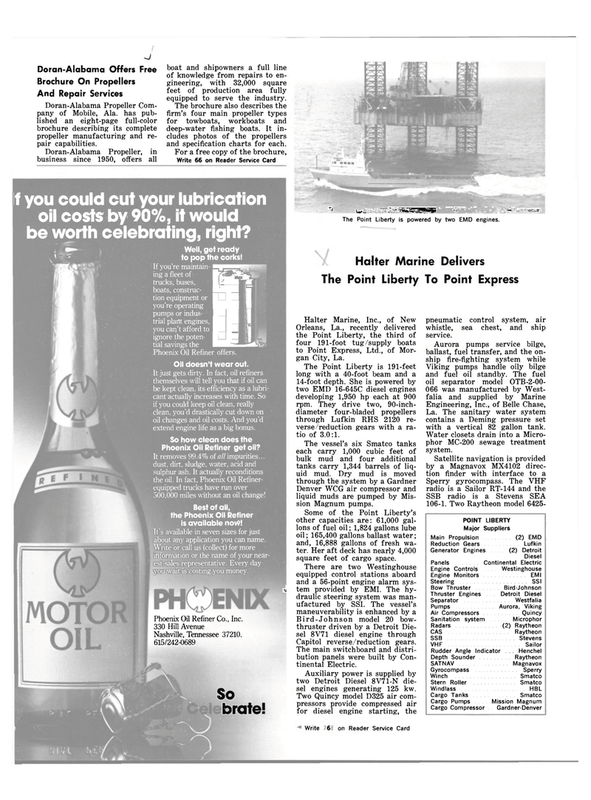 If you could cut your lubrication oil costs by 90%, it would be worth celebrating, right? «*•» Well, get ready v 7 to pop the corks! It just gets dirty. In fact, oil refiners themselves will tell you that if oil can be kept clean, its efficiency as a lubri- cant actually increases with time. So if you could keep oil clean, really clean, you'd drastically cut down on oil changes and oil costs. And you'd extend engine life as a big bonus. Phoenix Oil Refiner get oil? It removes 99.4% of all impurities... dust, dirt, sludge, water, acid and sulphur ash. It actually reconditions the oil. In fact. Phoenix Oil Refiner- equipped trucks have run over 500,000 miles without an oil change! It's available in seven sizes for just about any application you can name. Write or call us (collect) for more information or the name of your near- est sales representative. Every day you wait is costing you money. The Point Liberty is powered by two EMD engines. Orleans, La., recently delivered the Point Liberty, the third of four 191-foot tug/supply boats to Point Express, Ltd., of Mor- gan City, La. The Point Liberty is 191-feet long with a 40-foot beam and a 14-foot depth. She is powered by two EMD 16-645C diesel engines developing 1,950 hp each at 900 rpm. They drive two, 90-inch- diameter four-bladed propellers through Lufkin RHS 2120 re- verse/reduction gears with a ra- tio of 3.0:1. Denver WCG air compressor and liquid muds are pumped by Mis- sion Magnum pumps. Some of the Point Liberty's other capacities are: 61,000 gal- lons of fuel oil; 1,824 gallons lube oil; 165,400 gallons ballast water; and, 16,888 gallons of fresh wa- ter. Her aft deck has nearly 4,000 square feet of cargo space. The main switchboard and distri- bution panels were built by Con- tinental Electric. Auxiliary power is supplied by two Detroit Diesel 8V71-N die- sel engines generating 125 kw. Two Quincy model D325 air com- pressors provide compressed air for diesel engine starting, the 34 Write 360 on Reader Service Card pneumatic control system, air whistle, sea chest, and ship service. La. The sanitary water system contains a Deming pressure set with a vertical 82 gallon tank. Water closets drain into a Micro- phor MC-200 sewage treatment system.